The average western diet is acid-producing. When acidic wastes accumulate, they cause organs to malfunction and break down. This creates a fertile breeding ground for various forms of chronic diseases that are now experienced by a majority of our population. If you often feel tired or sick, it’s probably because you are overly acidic. The human blood must maintain a delicate balance between alkalinity and acidity. Acceptable ranges for the human body are 6.5 to 7.5. You can easily test the alkalinity of your saliva and urine using pH strips. You can purchase them over the counter at the pharmacy, Whole Foods stores and online. We’re sick and overweight because our body is too acidic. Plain and simple. Don’t go on another diet, instead work on reaching the proper pH balance. In the mean-time put exercising on hold until you’ve reached alkalinity. If you exercise when you’re body is acidic, you’ll just make it even more acidic. When you’re body is extremely acidic, you don’t get enough oxygen, when you don’t get enough oxygen everything slows down including the metabolism even though you’re working out. The body becomes too acidic as a result of acid forming foods, cooked food, mucus forming foods and toxic residues. An acidic body is at great risk of developing diseases such as osteoporosis, weak muscles, heart disease, diabetes, kidney diseases and a host of other health problems. The human body should be slightly alkaline in order to build an alkaline reserve for acid-forming conditions such as stress, lack of exercise or poor dietary habits. Balancing our pH levels is one of the most important things you need to learn and do. In order for our body’s cells to function at peak capacity, ensure that your body’s pH levels are in slightly alkaline state (that means with a pH of slightly 7). pH is the measure of hydrogen and oxygen ions (electrically charged particles). Your blood, urine, saliva, digestive juices, mucus, and the fluids inside and outside of the cells each have an optimum pH level. 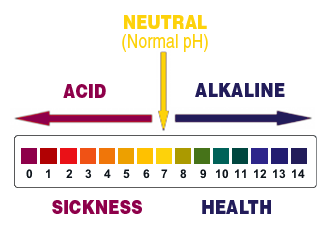 While our digestive juices are quite acidic, your blood pH level must slightly alkaline. The process of restoring pH balance begins with proper diet and nutrition. This includes eating alkalizing foods such as vegetables and low sugar, fruits, etc., cellular hydration (drinking plenty of structured water), and proper supplement. Normal pH level in healthy people are slightly alkaline , 7.1 to 7.5 pH. When acidic foods lower the body’s pH , the kidneys coordinate efforts to buffer that acidity. Bones release calcium and magnesium to reestablish alkalinity, and the muscles are broken down to produce ammonia, which is strongly alkaline. By the time the response is all over, your bone minerals and broken down muscle get excreted in urine. Long term, excess acidity leads to thinner bones and lower muscle mass. Over 150 degenerative diseases are linked to acidity, including cancer, diabetes, arthritis, heart disease, gall and kidney stones and many more. Acidic pH level in human body fluids are prime environment for bacteria, virus and other undesirable menace. If your pH level isn’t balanced, it cannot effectively assimilate vitamins, minerals and food supplements, therefore keeping our bodies pH level is essential for maintaining good health. Over the long term the effects of sodas are devastating to the body. Acidity, sugars and artificial sweeteners will shorten your life. When you drink sodas, the body will use up reserves of its own stored alkaline buffers, which are mainly calcium from the bones and DNA to raise the body’s pH levels. Acidic blood levels can cause death. Most degenerative diseases we call “Old-Age Diseases”: like memory loss, osteoporosis, arthritis, diabetes, hypertention and many more are actually life style diseases caused by acidosis, the lack of nutrients, minerals and vitamins, poor diet and improper digestion. Aches and pains are acid. Lack of oxygen. Blood cells are far apart from each other in the alkalize pH condition. As a result, your body can move freely throughout your entire body and get into all your small capillaries carrying oxygen you need. Hence, you feel energized. During deep, proper blood flow and hydration is important. Blood cells have a negative charge on the outside and a positive charge inside. This is what keep them healthy and far apart from each other. However, when the body is over acidic, the acid strips the blood of its negative charge, losing the same repelling force, resulting in the clumping of cells. When the blood cells are clumped together, it no longer can get into the small capillaries. Less oxygen is being carried throughout your body and you no longer feel the energizing and rejuvenating affects. When your body pH is acidic, it’s prime environment for bacteria, viral, even cancer cells to grow. Americans consume more calcium-rich dairy foods than almost every other nation and yet we have one of the highest rates of osteoporosis. We are also the only species that continues to drink milk when no longer a baby. Dairy may be rich in calcium, but produces an acid yield. You can reverse osteoporosis and build bone mass, even while going through menopause by keeping your body alkaline. How do you know if your body is acidic or alkaline? You can test yourself by measuring the pH of your urine or saliva (less accurate) using pH strips from any pharmacy, health food market, or online. It’s simple and inexpensive. As you awaken, before you drink or eat anything, put some saliva on the test strip. Compare the color to a pH color chart that comes with the test strips. Next, measure the pH of your second urination of the morning. To do this, urinate on the strop or collect the urine in a plastic glass (not paper) cup and dip the test strip. Again, compare the color to the pH color chart. Retest a few weeks after changing your eating habits. The most accurate method is to test the blood. Most clinics that do blood-work should be able to do this for you. Of course, there is an even easier way to know if your body is alkaline. Just think about your diet. Are you consuming a lot of caffeine or alchohol? How about meat? How about breads, pasta or other starches? If so, youre body is probably struggling to keep itself in an alkaline state. The impact on your overwell wellness is too great to ignore. The body’s pH is measured on a scale of 0 – 14. Midrange at 7 is where the pH is balanced. Anything below 7 is acidic and a state where your body does not function as designed. Above 7 is called Alkaline. Alkaline is the state in which your body thrives. Disease cannot live in an alkaline environment. Acidic foods strip your body of minerals. The Standard American Diet (S.A.D.) radically imbalances this all-important nutrient ratio. The mass consumption of meat and grains causes the body to become overly acidic. ENJOY maximum energy all day, everyday. The more alkaline the better our state; and the more acidic, the more emotionally troubled we are. If you take care of your body, but ignore your emotions you will not maintain your terrain. Inherently the body will do everything it can to maintain that pH. This is necessary to run the entire body’s biochemical pathways for detoxification, building, and general maintenance. The body has several control mechanisms to keep it at this pH and they include getting rid of excess acid or base by-products through the lungs, saliva and urine. When your body is sick in any way this pH is disrupted. Most times your body is trying to keep up with the extra acid produced. Acids are produced from lack of oxygen, eating an imbalance of protein and carbohydrates and other acid producing foods, and by cellular breakdown and production of metabolic waste. Negative thoughts can create an acid body. So, to be chronically ill and have diseases such as cancer, fibromyalgia, chronic fatigue, arthritis, etc., the body is in a very acid state. The answer is to Alkalize, Alkalize, Alkalize!!! – Lemons (they are acidic, but in your body they are a potent alkalizer. Don’t Drink While Eating. This stops the digestive process from beginning within the mouth. Chew thoroughly. Saliva is a very alkaline fluid that begins the digestive process. Eat Celery. This is one of the most alkaline foods you can eat. It quickly neutralizes acids. Eat it before, after or during a meal. Celery is so high in water content that is also works as an excellent thirst quencher. Celery is excellent for digestion. Eat Green Salads. Some greens that have the highest water content are: cucumbers, lettuce, tomatoes, celery, broccoli, cabbage, spinach, cauliflower, carrots, and onions. A great dressing would be cold pressed extra virgin olive oil with some lemon juice. Reduce stress daily by adding yoga, tai chi, meditation, and proper breathing. An additional factor that adds to acidosis (acidic bodies) is stress. When the body moves into stress mode the digestive system shuts down and toxins cease to be eliminated. Thus the more toxins you keep in your system, the more the body will store them away (acids) in fat cells! Anything we can do to calm the mind/body will have a huge impact on alkalizing the body. Drink a top quality super green supplement. Organic super greens are known to be some of the most nutrient dense foods on the planet. They infuse the body with easily absorbed vitamins, minerals, amino acids chlorophyll, enzymes, phytonutients and alkaline salts that help neutralize acids in the blood and tissues. Avoid cooked, processed and refined foods. Our bodies were not designed to digest these chemicals and so it must do one of three things: 1. Eliminate them (if you are not hydrating properly this is very hard to do) or 2. Neutralize them by pulling alkaline buffers where it can – like from your bones leaching calcium, or from your blood, leaching iron. Or: 3. Park them away (in fat cells). Bottom line here – stay away from processed food as much as possible. The hydrogen ion on the left has a positive charge; the hydroxyl ion on the right has a negative charge. The left is acidic; the right is alkaline and has oxygen. In nature, opposites attract and these two form a water molecule consisting of two hydrogen atoms and one oxygen atom. This molecule is balanced, with no charge and is neither alkaline nor acidic, but is neutral. To maintain proper pH we have to be in balance like the water molecule. Alkalinity and a negative electrical charge go together. This is where our magnetic therapies come in, our Yoga and Qigong and Reike and acupuncture also. This is where a trip to the mountains or the oceans or the Grand Canyon come in. Love and happiness and families unfettered by conflict build electrical charges in our bodies. Oxygenated water (ozone), alkaline water, negatively charged water and beds giving off negative ions; these are new products being developed for the sole purpose of charging and alkalizing our bodies. They don’t cure any particular disease, they just make our terrains well again. 2. Soda, even sugar free and diet soda. Aspartame turns into formaldehyde and acid in your body. When you are acidic, your metabolism gets clogged down. The drink might say “Diet” but you won’t lose weight with this stuff in your body. 3. Sugar. Especially white sugar or high fructose corn syrup. Anything with sugar added will increase it’s acidifying properties immensely. 4. Anything containing carbon dioxide, phosphoric acid, aspartame. If you drink charged water, you are drinking a waste product. Our bodies give off CO2 as a waste product. Why would anyone want to drink a waste product (if they thought about it long enough)? 5. Meat, poultry, and fish. All of these “cooked” proteins cause our bodies to become acidic. Eating them raw would be a better option but ONLY if the methods we raised them and processed them were healthier. The foods you eat have a major impact on your body’s acid-alkaline balance. Digestion of processed foods, for example, will create acidic byproducts that flow into the bloodstream. The more processed foods (sugars, refined carbohydrates, etc.) you eat, the more acid-byproducts will be created and the more acidic your bloodstream will become. Take any pickle from your local supermarket. It is terribly acidifying. Now, take a pickle that you made at home, using Celtic Sea Salt Brand, organic non-pasteurized apple cider vinegar, fresh organic cucumbers (and onions and garlic and peppers) and fresh organic spices, and you have the exact opposite of an acidifier. You have an alkalizer. I read somewhere that this book is a must-read, but is currently out of print. Practitioners of various modalities of meditations, yoga, and qigong live longer than people who do not practice these “internal” arts. This is because part of the practice is deep breathing and oxygen is alkalizing. Most of us breathe into our upper lungs and raise our shoulders. Only a portion of our lungs exist up there. The diaphragm is below our lungs where most of the air sacs exist. Deep breathing means thrusting the diaphragm downward pushing out our tummies first and then filling our chests afterwards. You can do this in any position – lying, sitting or standing. Quiet the room of distractions like turning off the television or closing the door. Take a deep breath in through your nose. Pretend you are sniffing a flower. When you inhale, your abdomen or stomach should rise and then your chest. Hold for a few seconds. Exhale in reverse pattern through your mouth. Let your body relax and go limp. Do this over a few seconds. Repeat this as long as you need (a few to 10 minutes). When tense or anxious, your breathing becomes irregular and shallow. Deep breathing has long been known to have relaxing properties. Oxygen tends to revitalize, energize and relax. Lie on the ground or sit in a position where your spine is straight. Tense all the muscles in your body completely as you inhale. Concentrate on the tension and hold tight while slowly counting to ten. Gradually let the muscles go as you exhale and feel the contrast. Try to let go and relax totally. Repeat two to three times. Exhale completely. Notes: To check whether you are breathing into your lower abdomen, place one hand on your chest and the other on the abdomen over navel. Inhale and feel which hand moves the most. If your breathing is efficient, the lower hand should move the most. Once you’ve learned to breathe into your tummy, inhale very, very slowly, allowing the breath to enter effortlessly through your nose. At the same time, push out your abdomen as though you were blowing up a balloon in your belly. Move your chest as little as possible. After your abdomen is stretched, expand your chest with air. This fills up the middle part of your lungs. Hold the breath for about five seconds and then slowly begin to exhale. As you do so, let your abdomen fall and relax. Repeat this for twenty breaths. Focus your attention on the movement of your abdomen as you inhale and exhale. Electrolyzed Water is NOT stable (no matter what anyone tells you), and it quickly turns back into ordinary water. PH starts to go down right away. The next best thing is a naturally alkaline water called AquaLyte. You put one sachet (tea bag) in a liter of water, let it sit overnight , then shake in the morning. I’ve seen it take water that was 5.8 up to 8.8 in just a few hours.